Palestinakomiteen i Tromsø har kontakt med en gruppe unge aktivister i Gaza, som gjerne vil fortelle om «The Great March-to-Return Initiative» som skal skje i perioden fra Landdagen 30. mars til Nakba-dagen 15. mai. Initiativet har også nådd andre medier, og Aljazeera har publisert en artikkel som omtaler aksjonen. Her viderebringer vi det vi har fått fra Gaza, med håp om at vår oppmerksomhet om saken og mulighet til å dele den også har betydning for situasjonen for folk i Gaza og ellers i Palestina. «It is a sit-in intended to grow into a peaceful march of Palestinian refugees to their pre-1948 lands as part of their struggle against Israel’s occupation and apartheid regime. The idea was initiated by a group of Palestinian activists in the Gaza Strip, and their call for this march has already been gathering huge momentum and support from the public, not only in Gaza, but also in other Palestinian refugee-concentrated places in neighbouring countries, as well as elsewhere. The idea of this march has already gained interest from various Palestinian political parties and groups. Most of the Palestinian political and civil organizations have welcomed the idea, expressing willingness to participate. Advocates of this event have repeatedly emphasised that it is peaceful, calling on all international organizations to take part in monitoring both the peaceful crowds as well as Israel’s action responding to the event. The sit-in is a popular, non-partisan event, with all Palestinians and international solidarity movements, groups and organizations invited to take part. 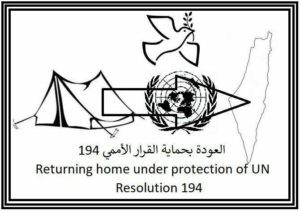 Only the Flag of Palestine and another of UN Resolution 194 will be lifted by peaceful demonstrators. The march is a cry from the Palestinian refugees who have endured more than seventy years of agony and misery in refugee camps; it is an insistent determination that life in these refugee camps lacking the minimum standard of a life of dignity will no longer continue. The increasing talks about America’s intention to arrive at an unjust settlement of the refugee question is prompting more and more Palestinians to come together around the idea of this march for return. 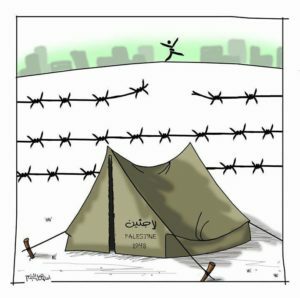 Palestinian refugees have been living under dire humanitarian conditions in the ​​360-square-kilometers enclave that is home to over 1,912,000 Palestinians, two thirds of whom are displaced refugees. The Gaza Strip has been subjected to a crippling blockade and closure suffocating residents and imposing blanket restrictions on their right to movement. According to UN reports, Gaza will not be livable by 2020. Refugees in Lebanon and the West Bank are no better. More than 3,600 of Syria’s Palestinian refugees have been killed. More than 120,000 of them are displaced outside Syria, while the number of IDPs is two times higher. Practically realising the Palestinians’ right of return is not only about refugees, but also about stability and justice in the Middle East. With the Palestinian refugee crisis unresolved for over 70 years, Palestinians’ appalling living conditions are only exacerbating. The Gaza Strip can no longer contain its population, especially given the blockade and closure of crossings. 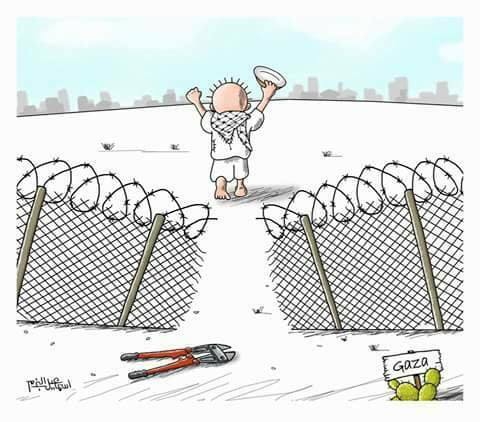 This is why Palestinians feel that they must free themselves from this prison. Rather than waiting to be driven to a new exile, they have decided that their destination is their homes from which they were expelled. Palestine is enough for all, a fact the Israeli government continues to unjustifiably ignore. Most of the villages from which the refugees were expelled are still empty. That is, Palestine has room for refugees to return without Israelis ever needing to leave. The Israeli government’s refusal to return refugees is racist and exclusive. The values ​​of democracy, dignity and equal citizenship for all are today’s universal values. Therefore, the march-to-return initiative is a means for the peaceful return of refugees, living in a state together with Israelis on a democratic basis, not a discriminatory one.